Things have been busy here in the Fairy Den. Lots of sewing & embroidering happening which means new products for you!! Secondly I have released our NEW I-Spy bags. What’s an I-Spy bag you say? Lastly don’t forget to enter our April competition where you can win your very own Stab’Em doll. Some one making your life a misery? Want to vent your frustrations without causing harm? Well The Sewing Fairy has the answer for you with our novelty voodoo dolls. Available in Husband, Wife, Postman, Taxman, Teenager, Ex Husband, Ex Wife, Child & Dieting with sayings appropriate for each theme. We even have a Love doll so all your desires can be met! our Stab’Ems come with 4 pins so you can start venting immediately. NB Stab’Ems voodoo dolls are sold as a novelty only, no harm or spells will be cast by using a Stab’Em. Not recommended for children due to sharp objects. Hope you all had a great Christmas & a wonderful New Year. We did in our household & the holidays have been wonderful so far…………*touch wood* ……………… but now that all the Christmas bling has gone, its time to think about those school book lists we got back in November 2008. To help with the cost of sending the kids back to school we have put our Library Totes and our Art Smocks on special for the next 2 weeks only. We have also released a new product called Lip Gloss or Memory Stick holders these are so handy to have on hand and have been a hit with my product testers. These are also at an introudctory price of $6 each for the next 2 weeks. As always pass this newsletter onto anyone you think may like to receive it & you can post it onto any groups you are a member of if they allow. 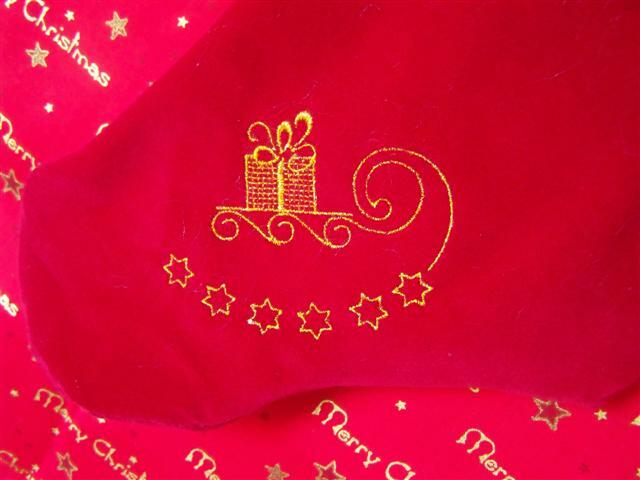 Here at The Sewing Fairy we love Christmas & all the magical joy it brings to families around the world. The joy of giving is just a wonderful feeling to have and with that in mind we are having a Christmas giveaway. and you are in the running to win 1 of 3 personalised Christmas Stockings. And what a great way to count down the sleeps??? Instead of those chocolate filled advent calendars that have the kdis eating chocolate every morning for the first 24days in December check out the Christmas Countdown Calendar where the kids can rub out & change the number each day. 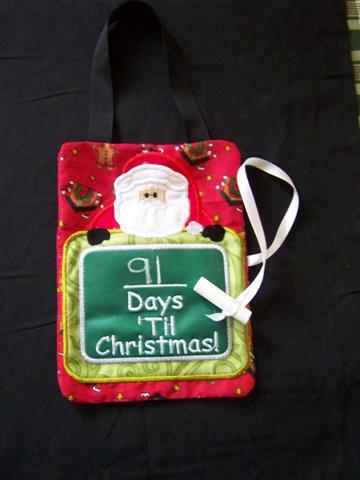 Made from gorgeous Christmas fabrics & with a piece of chalk attached to a ribbon for changing the day number. 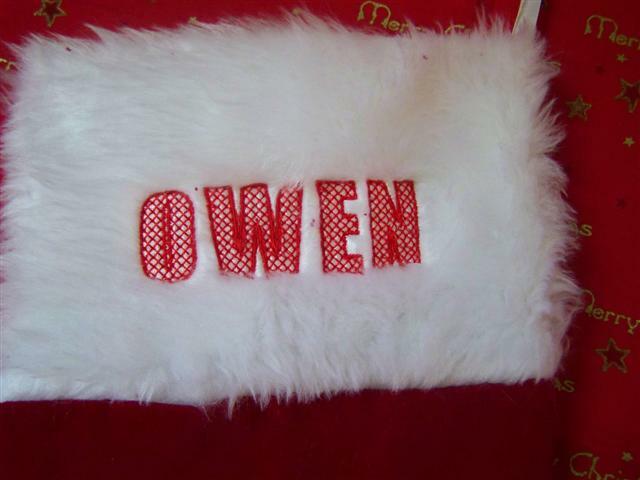 Recently a lovely lady from All For Women contacted me about a personalised Christmas stocking for her nephew Owen. Last year I did personalised stockings but with the rush leading up to Christmas I never actually got them onto The Sewing Fairy site & with many people leaving them to the last minute to order can you believe I actually forgot to take photos!!!! But I did take photos of Owens before it left the Fairy Den. Detail on the ‘toe’ section of the stocking, stitched in metallic gold thread. How wonderful are peoples generosity ?? As you know I do a lot of embroidery for the Purple Bra Day here in Northampton which is a fundraiser for the Breast Cancer Foundation of WA. Everything I make for them I donate 100% so they can sell them at a good price & they donate 100% of the money raised to BCF WA. Well over the years I have contacted various companies I deal with & have had numerous threads & stabalisers donated to the cause. As I do all my embroidery on a Janome 300E & only use Janome Blue Tips (needles) in the machine, I contacted Janome to see if they would perhaps donate a packet or two of Blue Tips. (5 needles per packet). I sent them photos of items I have made, contact numbers for the people who co-ordinate the day so they could verify what I do & that I am not just someone after a free ride. Well imagine my surprise on Monday when I collected my mail & there was a parcel awaiting pickup & when I opened it, it contained a FULL BOX of 500 Janome Blue Tips!!! OMG I couldnt believe it their generosity is astounding!! I have written to them to thank them for the donation & placed the needles in the big box marked Purple Bra day, as I keep all their items seperately & ONLY use them for Purple Bra stitching!! 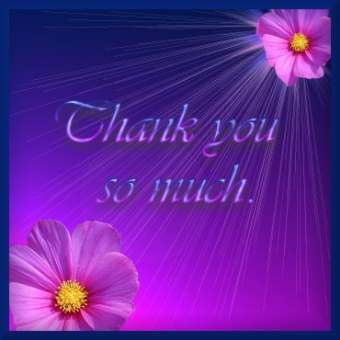 Janome Australia THANKYOU from the bottom of my heart you are truly wonderful!! !